..I had a fav cat go feral....that's maddening....could it be because she wasnt spayed?? ?....last time I saw her she was chasing a rabbit in the field next to us...when she had a perfectly good bowl of food left out. p.s. Incase you were wondering why she wasnt spayed--she was 5 months old when she ran off...the vet wanted me to wait. Suzie was spayed so don't think it was that. She has always been 'semi feral' in that she usually slept in the garage in our old house, only coming into the house when it was very cold and usually when we weren't around. She would come to see you but would *n ever* dream of sitting to get stroked or sit on your lap or anything like that mand, as I said, would often go awol for up to a week at a time then come strolling back one evening. I would prefer to think that she was happily feral than the alternative . My 2 just vanished. Very shy cats who moved out when the builders arrived. No sign of them , I believe they were fed somewhere else. How are the chicken newbies getting along? Anyone got any then? Ah not yet Triker but thanks to you and all the other wonderful posters it won't be long!!! I have done loads of research into chickens, providers and coop designs and am starting to build the coop and run this weekend. Unfortunately our wooden mirror dingy has had to go as it was stoered behind the greenhouse which is where the chickens will go. OH has finally realised it is not going to go away and is giving in gracefully and even mentioned it to people at work - ha ha!!! 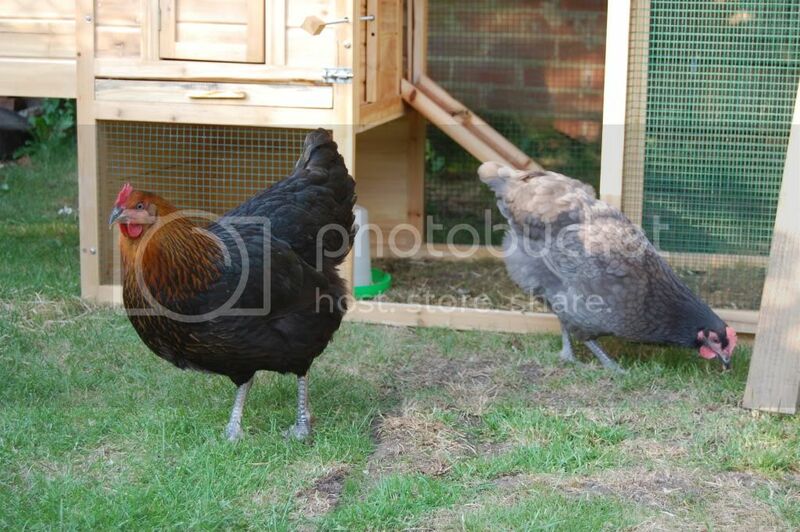 Have decided to get two Hybrids to start as they are the heaviest egg layers to begin with being bred for quick, early egg production - probably Amber link or similar as they are a smaller breed and then in six months or so get another two pure breed hens as they tend to lay less but for longer. Can't wait and it is really hard to get the coop and run done first - I have found a good breeder about 35 miles away but there is a 'Feather and Fur' sale on at a local mart on a Saturday morning every week so will go there first and have a looksy. Am going to get POL too. I will - I was going to get the girls a pet rabbit but thought we might as well get something with a use too!!! Update - We got our chickens yesterday! We were going to be building a coop but unfortunately we have not had the time (well OH hasn't had time!) with the girls it is hard to get a few minutes let alone a few hours lol! We bought a new coop for ?100 delivered off ebay (not the best quality but it will tart up and is a whole other ebay story ) which we are going to extend and am currently clearing out the space behind the greenhouse to give them a larger run to scrat around in and also will let them roam the garden when we are around. Annie is a Rhode Rock (black one) and Clarabel is a Blue Haze (grey one), girls named them before we even went for them, they were going to be Thomas and Gordon but their Nanny managed to talk them round ha ha!! Clarabel has already had to be rescued from next door's garden, used my shoulder as a trampoline and flew over my head - then found the only gap in the hedge to get through They are about 23 weeks old and just at point of lay. 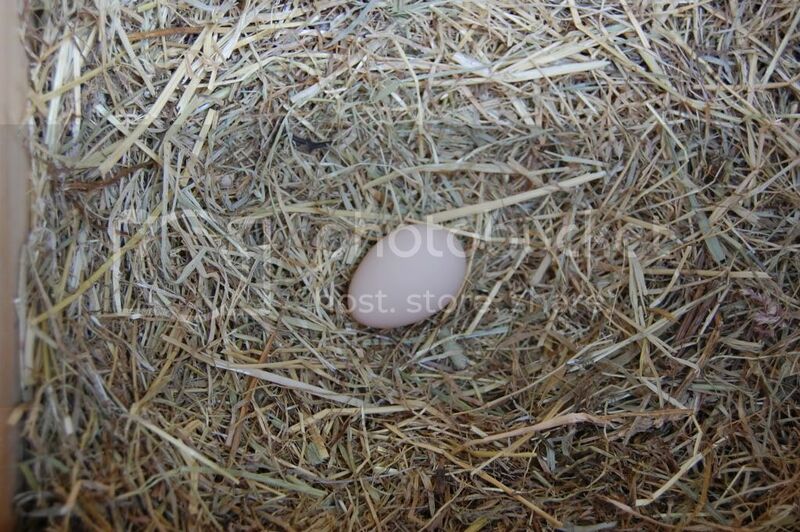 Our first egg - think it was Annie as it was in her nest box.